Hi! My name is Greg, better known as The Kindergarten Smorgasboard! I love to share ideas for teaching and learning with lots of glitter, glam and mustaches! I am honored to be a guest blogger for Teacher Created Resources. 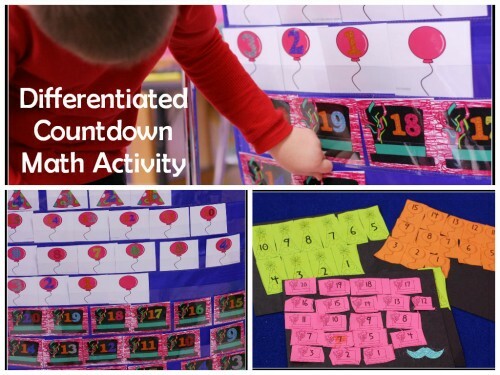 Today, I’d like to share a fun and simple New Year craft and math activity that you can do in your classroom. This New Year project is a fun and simple craft to make. Each child makes a portrait of themselves at a new year’s party. I provide each child with an oval for the face, a triangle for the hat, googly eyes and scraps of black and brown paper to make hair. I provide a few instructions up front but gave the students the freedom to get creative with their self-portraits. I used blue glitter paper on the bulletin board to keep with the New Year celebration theme. Once they finished their portraits, I posted them to the bulletin board and taped a noisemaker on the mouth to finish the project. 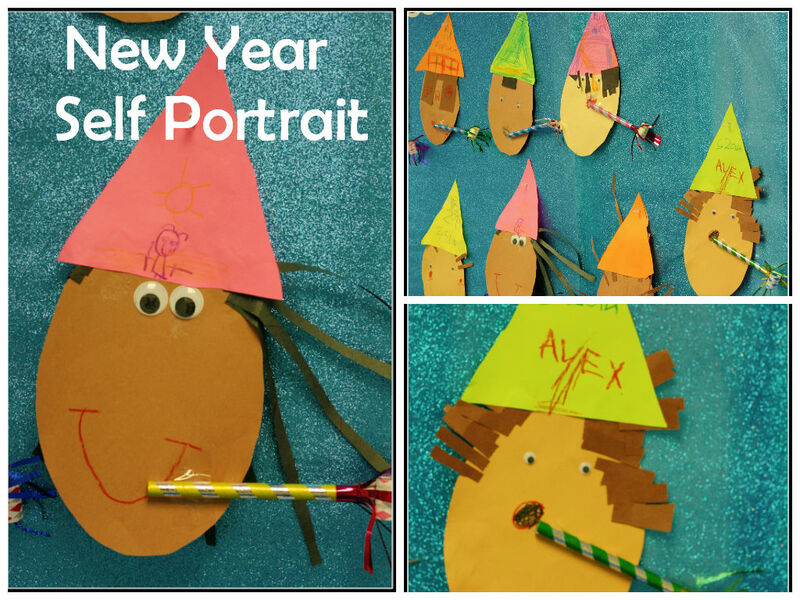 I love how all the self-portrait turned out and how creative and fun the students are, especially with the hair! Our new year’s math lesson was a fun and differentiated countdown activity. We start this math activity as a group, then each student practices on their own. The students really enjoyed counting down. I passed out New Year themed number cards. The students placed the number cards in the pocket chart and we did this whole group activity three times starting at 10, 15, and 20. After our whole group practice, each student got a sheet of paper and their own number cards to cut and paste on their own. This is a great differentiated practice activity. Thank you Teacher Created Resources for giving me an opportunity to share my ideas! I hope everyone finds something they can use! Visit The Kindergarten Smorgasboard, for more great classroom ideas. Love this fun idea, Greg!!! You have such great ideas and your students are SO lucky to have you!! !